A Lubitsch film adapted by the great Ben Hetch from the Noel Coward play about his relationship with the legendary Lunts*? The heart speeds, the mouth salivates. Yet, it’s extremely disappointing; indeed almost awful. Coward and Lubitsch are like oil and vinegar or rather two superb vinegars that might have got toxic when mixed by Hetch. The film tell of two artists, playwright Tom Chambers (Fredric March) and painter George Curtis (Gary Cooper), who love the same woman, like each other, and decide to share a flat. Miriam Hopkins is the ‘free spirit’ who makes a condition of their living together that she will critique their work but won’t sleep with either (probably everyone’s idea of hell). Fredric March was a big star, but on the evidence of his work here, his appeal is lost in the mist of time. 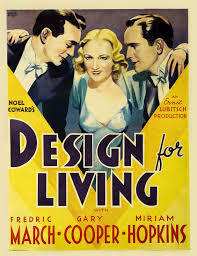 Miriam Hopkins is made for Lubitsch. She’s simply wondrous as the elegant crook in Trouble in Paradise and her Princess in The Smiling Lieutenant is a continuing delight (Her transformation from princess to flapper, culminating in her performance of ‘Jazz Up Your Lingerie’, ciggie in one hand hand, garters visible, and visibly vibrating to post-ragtime jazz, is priceless). She always exudes a slight harshness but here she doesn’t have enough funny lines to compensate. She seems merely harsh; and not as pretty as Gary Cooper. Orson Welles said Cooper was so beautiful he practically turned into a girl whenever he saw him; one look at Cooper here and one understands Welles completely – even Miriam eventually succumbs. He does some good double-takes too. But ultimately he’s unbelievable in the Coward role; whenever he’s discussing art you sense he’d really rather be on a horse. The first Lubtisch I’ve not liked. It is a pre-Code film and as daring as American cinema would get for another thirty years; but not delightful.